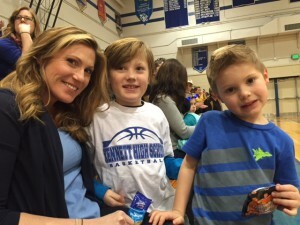 KENNETT SQUARE – On occasion ‘feeling blue’ is a great thing; like this Saturday when Kennett High School (KHS) hosted the latest in a series of Blue Demons / Kennett Pride events. 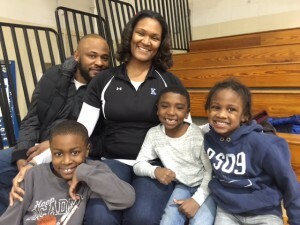 The greater Kennett community, elementary and middle schools were invited to come out, beat the winter doldrums and cheer on both the boys’ JV and Varsity basketball games with a goal of embracing Kennett Consolidated School District’s newly adopted mantra: #ALLIN. 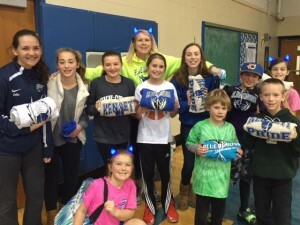 KCSD student winners of the half-time hoops raffle show off their free Kennett spirit wear on an afternoon when ‘feeling blue’ was a great thing. KCSD students received free game admittance and were each entered into a ‘half-time hoops’ raffle. Fun-loving KHS cheerleaders delighted the crowd by tossing Kennett spirit wear into the bleachers and fans jockeyed for their attention with the hopes of catching some free gear. 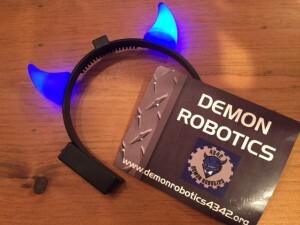 KHS Robotics Team’s popular light-up ‘Blue Demons horns’ headband. While the crowd was in the gymnasium with eyes on center court, just a few steps away members of KHS’ Robotics Team were busily working in the basement of KHS Annex displaying their own version of a big #ALLIN commitment. Robotics parent volunteer, Christina Gorman, kindly invited us to take a look at the behind the scenes happenings at one of the team’s typical 12 – 7 PM Saturday work sessions. “A lot of people may not realize that members of KHS’ Robotics team meet every day of the week, in some fashion, averaging three hours after school and between six and seven hours on the weekend…Students come in shifts to manage important team subcommittees that include marketing, strategy, hardware, programming and fundraising; it’s really incredible,” says Gorman. Currently, the team is ‘gearing-up’ for the First Stronghold Robotics Competition scheduled for March 18 – 20 at the Springside – Chestnut Hill Academy. The spirited afternoon ended with a talented, tough and quick moving Garnet Valley High School Varsity team dominating and eventually chalking-up a big win. Despite tough odds to turn the game around, the crowd continued to support Blue Demons players until the end; underscoring that KHS teams, their fan base and the greater Kennett community are #ALLIN. The Hogan Family ‘feeling blue’ at Saturday’s #ALLIN / #KennettPride event.